Hypersonic planes, lasers that burn drones out of the sky and machines that mimic the human brain once seemed like technologies on the fringes of science fiction. Yet several defense contractors are developing these engineering concepts for the U.S. military, hoping to get a piece of what is surely going to be a lucrative and lengthy contract. This week, Lockheed Martin's CEO touted investments in hypersonics, laser weapons, electronic warfare and artificial intelligence. Planes that can travel six times the speed of sound, lasers that burn drones right out of the sky and machines that mimic the human brain. All of these once seemed like technologies on the fringes of science fiction. Speaking to reporters at Lockheed Martin's media day on Monday, CEO Marillyn Hewson touted investments in hypersonics, laser weapons, electronic warfare and artificial intelligence. "Lockheed Martin has taken a leadership role in these four technology areas, and many others, to build an enterprise that can successfully support our customers' rapidly evolving technology needs well into the future," Hewson said. Here's a look at what the defense giant is designing. Speed is the new stealth. And when it comes to developing a high-speed reconnaissance aircraft, the Pentagon's top weapons supplier is playing in its home court. The Blackbird, still the second-fastest manned plane in history, flew for more than 30 years and outpaced anti-aircraft missiles lobbed at it. Today, the defense giant is upping the ante by engineering an unmanned plane it promises will be faster. 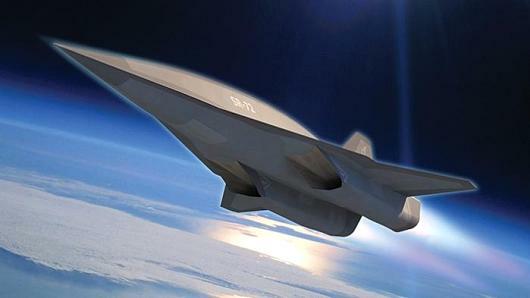 Dubbed the "son of the Blackbird," Lockheed Martin's SR-72 is envisioned to operate at speeds up to Mach 6. "This could forever change our ability to deter and respond to conflict, allowing warfighters to quickly address threats before an adversary may have time to react," Hewson said of the hypersonic plane. The SR-72 design incorporates lessons learned from Lockheed's Falcon Hypersonic Technology Vehicle 2 (HTV-2) experimental aircraft. The unmanned HTV-2 flew at Mach 20 or 13,000 mph after being launched from a rocket. At those speeds, the aircraft could travel from New York to Los Angeles in under 15 minutes. While the hypersonic SR-72 isn't expected to be operational until 2030, the company sees developing a platform of this magnitude as a game changer. "Hypersonic aircraft coupled with hypersonic missiles could penetrate denied airspace and strike at nearly any location across a continent in less than an hour," hypersonics program manager Brad Leland said on Lockheed Martin's website. The Pentagon has had a long-standing desire for powerful laser weapon systems that can be mounted and modified for air, land and sea. Lasers are invisible to the naked eye and can destroy targets at the speed of light with unmatched precision. What's more, these directed-energy platforms can strike repeatedly giving them a near-endless supply of ammunition or, as Lockheed says, "an unlimited magazine of bullets." "Lasers are the best match for high-volume, low-cost threats such as drones, which are becoming increasingly prevalent on the battlefield," Hewson said. 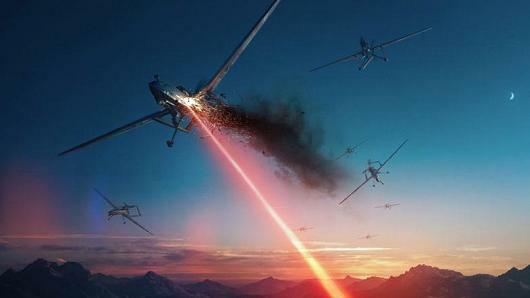 Last year, Lockheed supplied the Army with a 60-kilowatt laser that was later mounted on a large modified truck. The ground-based laser weapon system was used to destroy rockets, artillery, cruise missiles and drones, as well as other ground vehicles. The Army isn't the only service branch incorporating "Star Wars"-style technology into its weapons platforms. Lockheed has received a contract worth $150 million from the Navy to develop and deliver two laser weapon systems for shipboard integration by 2020. In November, the Air Force Research Lab awarded the defense contractor $26.2 million to develop a high-power fiber laser to test on a fighter jet by 2021. Electronic warfare is the use of radio, infrared or radar signals to confuse or disable an adversary's electronics. These technologies take shape in jammers, early warning systems and electronic decoys designed to lure away enemy attacks. For example, Lockheed's AN/ALQ-210 Electronic Support Measures system installed on some of the Navy's MH-60R helicopters gives pilots all of the aforementioned capabilities. The idea is for the ESM to act as an extra set of eyes and ears for service members in the battle space. Taking this technology a step forward, Lockheed Martin wants to add artificial intelligence to the mix. "We all know we have entered an era in which data is a strategic asset," Hewson said. "Artificial intelligence can help sort through this data, recognize patterns and anomalies and provide users with actionable information about threats and options to mitigate them." Correction: An earlier version gave the wrong year for the high-power fiber laser test. It is by 2021.